Shaping the Headmaster Collar by hand provides a custom fit. We recommend a health care professional measure and fit the collar: Doctor, Occupational or Physical Therapist. Bend the Headmaster to required width and height by simply adjusting with your hands. By placing the collar on the patient, you can continually adjust it for the proper fit, balancing both support and comfort. The collar will remain shaped the way you bend it for correct fitting, allowing fine adjustments. Bend the Headmaster Collar take pressure from the collars if necessary. Make certain the support is snug, fitting comfortably underneath chin. The strap only needs to be fastened around the back part of the neck. To provide additional support, you can choose from the essential accessories either of the padding for resistance to extending the head, and use the front supporting tube and chin pad to provide the front of the collar with additional support. A chin pad can be added to the chest portion of the support for extra padding. The accessories provide additional options for a proper fit according to the patient’s needs. People are using the headmaster collar due to problems with weakness as well as pain affecting the neck. It is light-weight and comfortable, sitting further below the clavicle compared to most braces. Additionally, the backside provides velcro and some cushioning and more so with the neck pad addition. 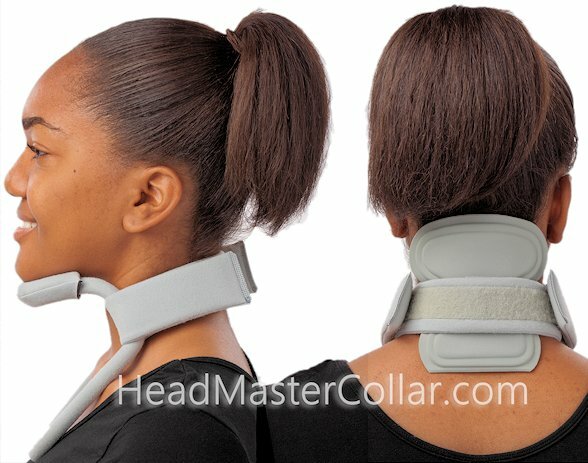 Whether you are recovering from neck injuries or have weak neck and head muscles, the Headmaster Collar could possibly be the solution to suit your needs. It is streamlined and also spacious style and design supplies the necessary support with out being intrusive as well as cumbersome. The fit is actually easy to customize simply by flexing the support for your structure. The particular neck padding with the essential accessories as well as extension padding options will be completely covered in cloth, providing a gentle and comfy experience. This specific minimal user profile neck collar is made from surgical grade rubber tubes, about a flexible foundation. The tubes are covered using a nylon material that permits Velcro strapping to adhere to any area of the support. The tube based style and design minimizes high heat maintenance as well as promotes air flow. The collar may be modified in order to respond to motion including flexion and also extension within the neck. It offers comfortable cushioning on the chin area for added ease and comfort. This particular support could possibly be advantageous for individuals suffering from spinal-cord traumas, burn patients, neck injury like significant whiplash trauma or cerebral palsy. It truly is designed to keep the head effectively situated, however it will certainly continue to allow for neck activity, both in flexing as well as extending. It fastens utilizing a very soft, versatile band which allows the front side of the neck to be open. You can use it along with a tracheal conduit if necessary.